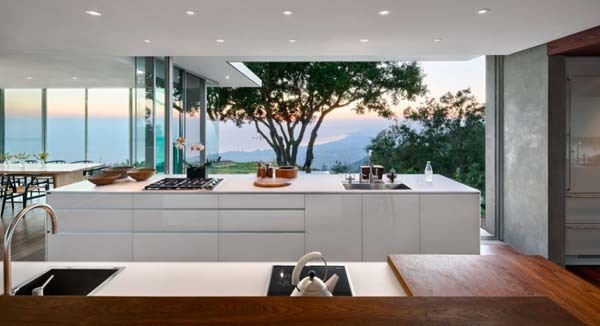 Contemporary interior decorating ideas are inspired by the panoramic coastal hill veiw. 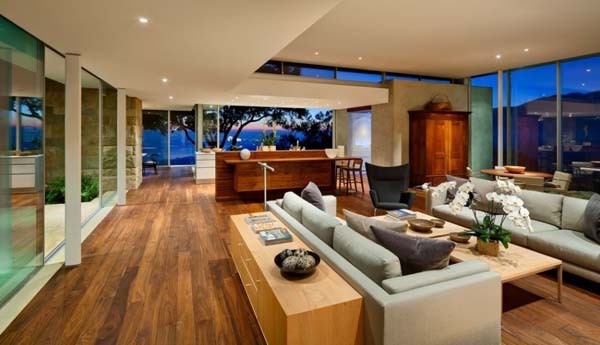 Glass and wood create light and warm room decor, and sliding glass doors add more comfort to the house design. Wood, glass and natural stone blend into balanced and attractive interior decorating ideas, perfect for creating peaceful and beautiful, tranquil and cozy place for living, enjoying hobbies and art. Informal modern living room design features comfortable sofas and impressive chair in grayish colors, that look calming with wooden cabinets, coffee table and wood floor. Modernistic cabinets and furniture items complement contemporary architecture and emphasize the couple’s taste for modern art and room decor ideas. Modern interior decorating ideas include a simple and elegant color palette, natural materials and forms. Sliding glass doors maximize the amount of light that highlight stylish room decor. The combination of natural stone fireplace design and glass walls, contemporary wood furniture and kitchen cabinets, combined with soft and pleasant furniture upholstery fabrics in light colors, create luxurious and comfortable home interiors. Simple and elegant room decor ideas, beautiful architecture with large windows create spacious rooms that delight and lift the spirit. Nature inspired, modern interior decorating ideas make a contemporary house design feel like a home, inviting and functional, pleasant and cozy.